British Airways has dropped the price of their 1-stop flights from Vancouver to Tel Aviv, Israel down to $761 CAD roundtrip including taxes. This is 38% below the typical best roundtrip prices between Vancouver and Tel Aviv. Unlike a lot of British Airways flights, connections to Tel Aviv don't require an overnight stay in London. Canadian citizens using Canadian passports do not require a visa to visit Israel. You can also try clicking on 'Flexible Dates' once your search completes on FlightHub, for more date options. vancouver, yvr, flight deals, tel aviv, israel, tlv, british airways and the middle east. 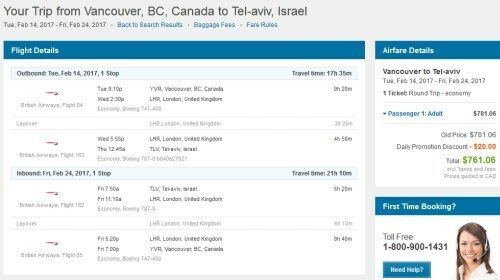 One Response to "Vancouver to Tel Aviv, Israel - $761 CAD roundtrip including taxes"